The Common Merganser (mergus merganser) is a large, slender diving duck that has a long, thin, toothy bill designed to catch fish. The Merganser is common along the Guadalupe River and can be easily identified by the unique bill that is also bright orange in color. 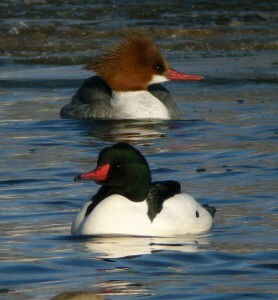 The male merganser is a handsome fellow in breeding plumage. During the spring he sports an iridescent greenish-black head with a crest, a bright white neck, underbelly and sides with a gray back and tail. The male also displays a black line along the sides of his back. During the non-breeding times of the year the male will look very similar to the female showing a rusty, brown head with short crest and a white chin. The body will be slate gray with white on the belly and sides. The female merganser can be identified by her rusty brown head with a short, ragged looking crest, a white chin, slate gray back, wings and tail and white on the flanks an d belly. Like the male, the female has the bright orange, narrow toothy bill. Mergansers can be found nesting along the Guadalupe River. A Common Merganser will lay 6-17 creamy white eggs per clutch. The eggs will usually hatch within 28-32 days. The female, who raises the young by herself, typically nests in a large tree cavity. Sometimes the cavity is in an old woodpecker nest or another naturally occurring cavity from a broken limb or other defect in a large tree. On rare occasions a merganser may use an artificial nest box or chose a cavity in hollow log or rock crevice. Newly hatched mergansers jump from the nest within a day or two of hatching and can swim and dive as soon as they reach the water. Unlike most other birds, the parent mergansers do not feed the babies. Young mergansers start diving and catching their own food right away. The young chicks will start by catching aquatic insects but quickly move up to catching the fish that make up a large part of their adult diet. The mother merganser will usually leave the young on their own before they can fly. Broods of young mergansers, sometimes as young as two weeks old, will band together after the mother leaves. The Common Merganser is considered migratory waterfowl but can be found most of the year along the Guadalupe River.